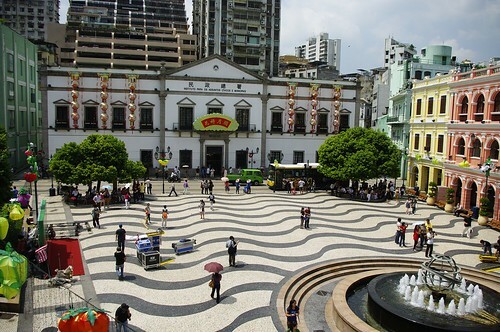 The former Portuguese colony of Macau is the perfect example of East meets West. While Macau is still proud of its Portuguese heritage, in the 21st century, it brilliantly fuses its present-day Chinese rule, making it one of the fascinating holiday destinations throughout Asia. Its history goes back to the 16th century when the city became home to Portuguese merchants and missionaries and — eventually — a colony. It wasn’t until the turn of the millennium when the city was handed back to the Chinese in the last two decades that Macau has undergone something of an entertainment revolution. Macau is the only place in China where gaming has been legalized, and despite its distinct Mediterranean personality, the casino scene is now one of the best on the planet and is considered a serious rival to Las Vegas regarding gaming revenue. Macau’s three-dozen casinos are a melting pot of entertainment options, from the gaming floors and Broadway-style theater productions to Michelin-starred dining. Nevertheless, if you’re new to visiting Macau and you want to experience a real taste of what the city has to offer, make sure you sample the following Macanese dishes. A real favorite among the Macanese people, if you only try one local dish during your time in Macau, please make sure that it’s Minchi. Every Macanese family has their own take on this iconic meal, and you’ll find restaurants in the city that have been serving this up for generations. Minchi is the perfect combination of all the influences on the city: Chinese, Portuguese, Malay and Indian. The basis of Minchi is minced beef or pork, which is combined with deep-fried potatoes and served on a bed of steamed rice and topped with a runny fried egg. It might not sound overly exciting on paper, but when you realize that the minced meat is marinated and sautéed slowly in a blend of herbs and spices, it creates a wonderfully rich and savory experience. Some of the best restaurants to sample an authentic Minchi in Macau include the restaurants overlooking Senado Square and A-Ma Temple. If you’re planning an active stay in Macau of exploring the city on foot, one of the best quick snacks to enjoy from one of the many food outlets is a pork chop bun. It’s become the iconic street food in the city. These fluffy white buns are filled to the brim with juicy pork chops that are often cooked in an aromatic marinade of garlic and ginger. Often the pork chops are cooked on the barbecue to order, so you can take in the sights and smells of the pork that serves to heighten your excitement while you wait. There are not many waffle stalls left in the city, but those that remain still boast queues that run around corners! If you’re walking around Ruins of St. Paul’s or the Senado Square, a Macanese waffle is another of those must-have pick-me-ups while you soak up your surroundings. Every waffle is handmade by these hard-working families in front of you, handed to you on a plastic plate piping hot — crispy on the outside and light and fluffy on the inside. Many of the locals devour their waffles with condensed milk and sweet peanut butter, but it’s possible to have them plain. Yes, we admit that it doesn’t sound overly appetizing, but try it before you mock us! Macau’s tofu puddings are soft, fresh and a protein boost — perfect for a mid-morning snack with a coffee. These tofu custards are sold throughout the old-school Macanese cafes and eateries. The locals will either have them coated in golden syrup or on their own. You can also choose to eat them hot or cold, although we prefer the former. As a former Portuguese colony, it would be wrong not to discuss some of the delicious flavors of Portugal in this colorful city. Porco Preto, known as black pork, is one of the more traditional ways of curing meat — as done so by Iberian black pig farmers. Porco Preto is on the menus of many of the city’s best Portuguese eateries, so you won’t have to look too hard to sample it. An authentic sandwich that hails from northern Portugal, Francesinha is a sandwich made with a bed of cured ham, fresh sausage, steak and other roast meats covered with gooey melted cheese and a rich tomato sauce. The locals tend to have a side of French fries, which they use to dip into the cheese and the tomato sauce. It’s a humble, honest dish that was traditionally reserved for the working classes but is devoured today by Macau’s locals and tourists alike. Possibly the best-known Macanese snack, Macau’s egg tarts are a fusion between the Portuguese pastel de nata and a British custard tart. Old Taipa Village is a well-known haunt for the Portuguese-style tarts, with a range of egg, fresh milk and coconuts tarts baked and sold fresh from the oven. In central Macau, you may also be lucky enough to find Portuguese cafes that sell their own chocolate-flavored egg tarts, but be warned: they go quickly! Macau may be just a short hop, skip and a jump from Hong Kong, but it’s a foodie haven. It’s worth noting that the Macanese diet is by no means low on calories; it’s hearty, rich and full of flavor, so don’t be surprised if you put on a few pounds during your stay! Nevertheless, this inclusive city is well worth a visit. From the noisy, pretentious casino element to the city to its quintessential city center back streets, there’s a pace of life to suit everyone. It’s safe on the whole and with no low-season to speak of, Macau is a place that can be enjoyed year-round. Behold the history and the opulence of the fourth-richest place on the planet. Have you visited Macau? What foods would you recommend people try while there? I love Portuguese food, so Macau was a must for me. We found a small place that grilled sardinhas (divine!) and made us a Bacalhau com Natas (cod fish with cream). Food coma heaven! All washed down with a local beer – superb.